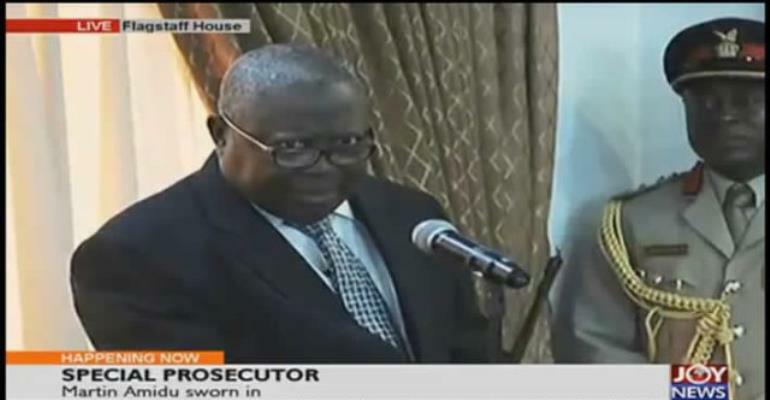 The Special Prosecutor Martin Amidu has used his swearing-in ceremony to pay a glowing tribute to a University of Ghana lecturer whom he has credited for helping him become a lawyer. "He ensured that I was not cheated out by the exclusion of my name from the LLB class list at the Faculty of Law after my first university exams when I had qualified for placement by merit" Amidu remembered the 43-year old gesture. Looking back at how the professor stood up for him when he was a nobody, Martin Amidu said the gesture "contributed in no small measure to my position, my passion for the defence of truth fairness integrity transparency and merit in public life". Martin Amidu who is now 66-years-old said had it not been for the professor, he "might not have been available for this job". Fate and destiny have conspired to land the anti-corruption campaigner the foremost anti-corruption task in Ghana as the first-ever Special Prosecutor. Rejected by the NDC after leaving the Atta-Mills government in 2012 under charged political circumstances, Amidu has been accepted by the NPP government with the President describing him as a principled lawyer and a man of integrity. Martin Amidu, the longest-serving deputy Attorney-General and one-time Vice-Presidential candidate to late President John Evans Atta Mills went to court after he was fired from government, single-handedly secured a judgment ordering an NDC financier to return more than â‚µ51.2m in wrongful judgment debt payments. In his lonely battles and fiery letters, Amidu exposed the Mahama-led NDC administration as a lethargic, excuse-giving government when it came to fighting corruption. He is facing disciplinary action within the NDC with some keen to have him expelled from the party for helping the NPP win the 2016 general elections. Amidu who spent more than 20 years in public service and six years out as a citizen vigilante, has landed a post that has endorsed his politically suicidal decisions to fight political corruption. The Special Prosecutor, a creation of the NPP government is to make the fight against political corruption a non-partisan one. During his swearing-in, Amidu showered praises on Akufo-Addo for proving that he prioritises the interest of Ghana above party after nominating a man from a different political persuasion. He said he would not have accepted the post had it not been for what he found in President Akufo-Addo as a man of integrity and honour. Describing Akufo-Addo as a professional adversary, Martin Amidu testified of the president's days in court as a lawyer during landmark constitutional cases in which Amidu was the deputy Attorney-General. Akufo-Addo at the swearing-in testified of Amidu's "tenacity" in court and his convictions which he said made him worthy of the appointment. He charged Amidu to bring this tenacity to his work for the benefit of the Ghanaian people tired of worsening corruption.